A video vixen catches her wig which fell off her head in Tanzanian singer Harmonize's newly-released music video titled Kainama. If you are planning on putting on a wig and going out dancing, then make sure it is tightly secured, unless of course you fancy picking it up from the dance floor. This is the lesson that a video vixen for Tanzanian singer Harmonize learnt during the video shoot of the artiste's latest song, Kainama. The moment when the dancer lost her wig is captured in Harmonize's newly-released video, featuring Diamond Platnumz and Nigerian singer Burna Boy. Head straight to minute 2:55. The song has been well received by the musician's fans with more than 1 million views already just days after its release. 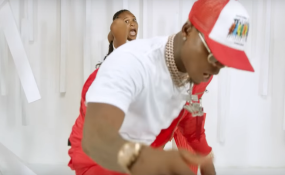 However, what has captured the attention of hawk-eyed fans is a small part of the video where one of the video vixen dancing behind Harmonize flips her head backwards, in the process sending her wig flying. She however recovers it masterfully before it lands on the floor and bends over behind the singer to put it back on her head.